Melissa Collison is one of our favourite designers and we’re delighted to have seen Saké Flinders Lane shortlisted for a 2016 Eat Drink Design Award. 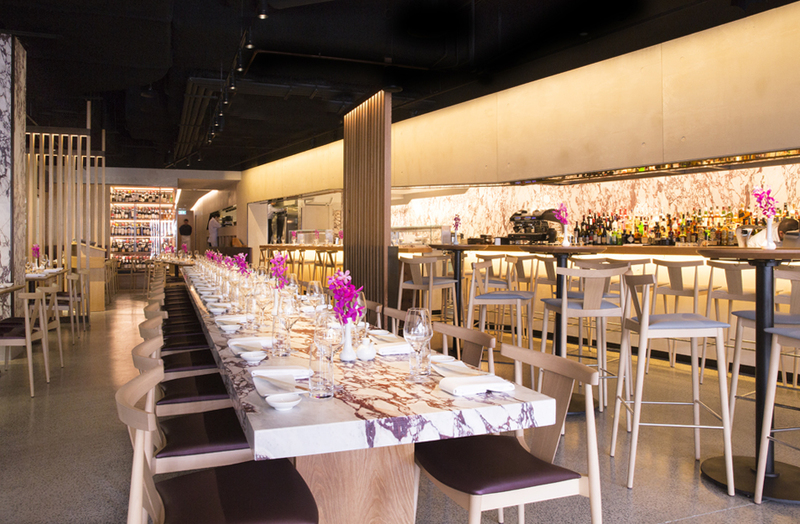 The Melbourne venue is the third Saké restaurant Melissa has applied her designer touch to, along with The Rocks and Double Bay, helping to create the dynamic and contemporary image and atmosphere of the award-winning restaurant group. 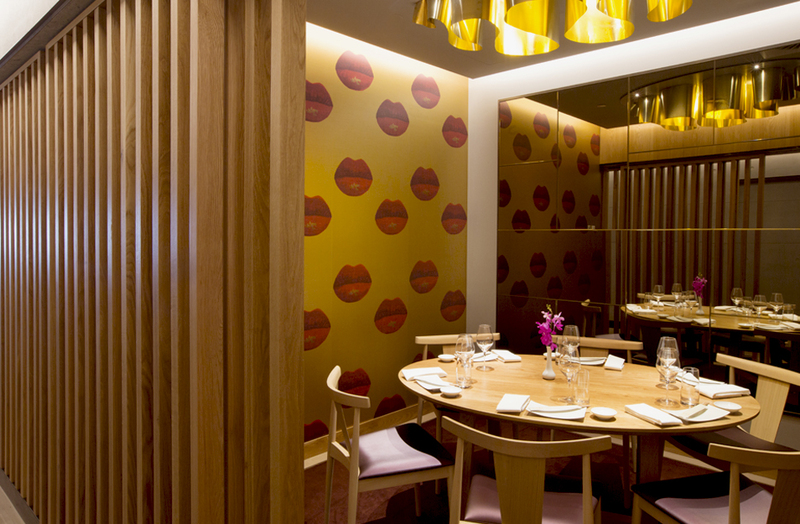 Luchetti & Krelle designed the original Saké Restaurant & Bar in The Rocks, Sydney, which Melissa recently refurbished with the addition of bamboo chandelier pendants, Koi-fish upholstery, and a fantastic conceptualisation of a modern geisha as a contemporary backdrop across the entire back wall. Melissa used one of the restaurant waitresses as her muse and directed a photography shoot that would inform an iconic motif throughout all the Saké venues. Saké Double Bay opened in 2014 beneath the InterContinental Hotel. The contemporary dining venue balances comfort and edginess and offers bar seating, a long shared table and a covered outdoor terrace. 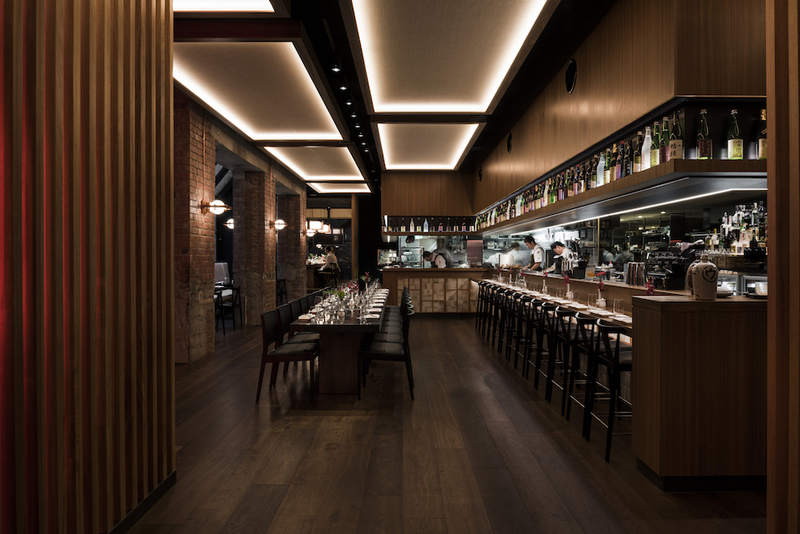 Timber screens provide a sense of division without being obtrusive, while honed Viola Calacutta marble tops the sweeping communal table, wraps around the columns and serves as a backdrop behind the monolithic concrete bar. And like Saké in The Rocks, Melissa conceptualised and directed a photo shoot of two women with traditional Japanese tattoos that she transformed into custom-made wallpaper. 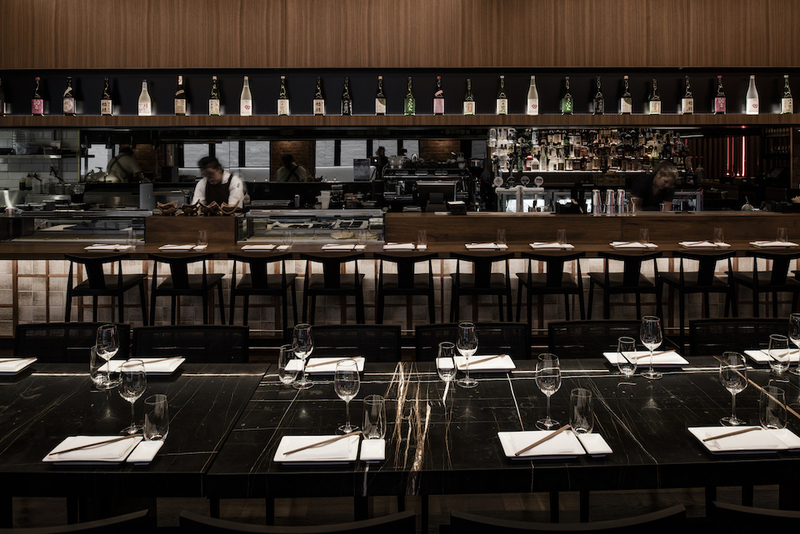 Flinders Lane is the most recent Saké venue with a long and narrow space inspired by the Japanese’s deep obsession with Western culture in the 1970s. “For Japan this was a period of economic growth and of trying to look and be all things Western. A time of big men, big deals and dark bars,” says Melissa. Thus the design references Japanese culture as it looked to the West. The rich interior is decked out with a palette of grass cloth, textured tiled, honed marble, teak veneers, blackened oak, cream leather and bronze mirrors. Red neon punctuates the stairs and Melissa’s hand-painted tattooed girl continues as a theme throughout. Both Double Bay and Flinders Lane feature Andreu World’s Smile chairs and stools designed by Lievore Altherr Molina. The beech seating aptly fuses traditional Japanese and Scandinavian design elements, and Melissa incorporated light-coloured chairs and stools in the Double Bay restaurant and darker ones in the Flinders Lane venue. 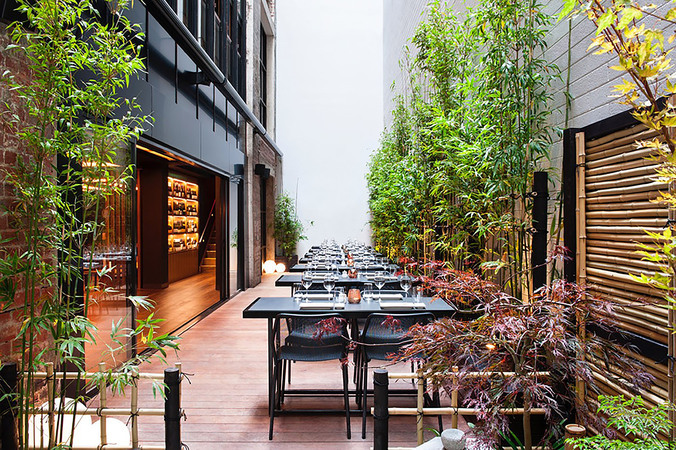 Saké Flinders Lane also has Andreu World’s Manila chair, which conveys grandeur and serenity, much like the Japanese culture; and in the outdoor dining space, Emu’s Darwin chairs are contemporary and elegant, much like the food being served. We’re always excited to see what Melissa serves up next in the world of hospitality, and whatever it is, we’re sure it will be one to raise a glass of saké to.